As the TMNT stand on the roof of the building that Cudley the Cowlick dropped them off on, they are assaulted by a bizarre flying bat creature! We’re introduced to two new characters, the bat man named Wing Nut and his faithful sidekick, a mosquito-like being called Screwloose. Wing Nut was trying to break the skylight windows on the building that the Turtles are standing on, but he hit Raph in the head with a rock by accident. On his second attempt, the bat dude manages to shatter the window, and he flies off. The TMNT scatter so as not to be blamed for the vandalism. The Green Team Supreme heads for home and greet Master Splinter. The boys turn on the news to discover that over 1,000 skylights have been broken! As April is reporting the crime wave, a live shot comes on about a blimp… being terrorized by a flying bat beastie! Wing Nut stabs the blimp with his sharp claw and then smashes the TV camera with a rock… the Turtles can’t take any more of this and set off to stop the whacky winged nutcase! For some reason, the Turty lads decide to take their own blimp, and it meets much the same fate as the previous one. Wing Nut dive bombs through the center of the air ship and sends it falling to the ground. Fortunately, the Turtles’ blimp is equipped with an air car that can fly on its own, and the boys give chase, much to Wing Nut’s glee. 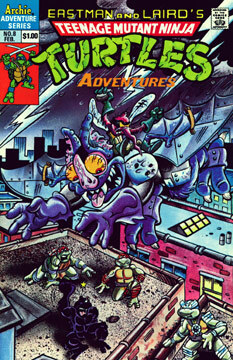 Eventually the TMNT capture the crazy vandals on a rooftop, and find out from Screwloose that the pair are actually aliens! It turns out that Wing Nut is the last of his race… Krang destroyed his homeworld! This drove the poor bat boy mad, with Screwloose being his sole ally. The two are searching the globe, seeking retribution against Krang. In his delusion, Wing Nut believes that Krang is hiding behind a skylight, and he’s breaking each one that he finds in hopes that he’ll locate the evil alien warlord. With their story told, Wing Nut makes his escape… but is quickly gobbled up by Cudley the Cowlick! When Cudley brought the Turtles home last issue, she inadvertently opened a dimensional portal that allowed Wing Nut and Screwloose to reach the Earth. The giant flying cowhead has returned to take the batty aliens back to Stump Asteroid, where she believes they might find a home.